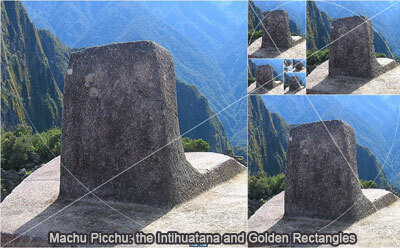 The Intihuatana stone is one of many ritual stones in South America. The Spanish did not find Machu Picchu so the Intihuatana Stone was not destroyed as many other ritual stones in Peru were. These stones are arranged to point directly at the sun during the winter solstice. Intihuatana also is called "The Hitching Point of the Sun" because it was believed to hold the sun in its place along its annual path in the sky. At midday on March 21 and September 21, the equinoxes, the sun stands almost above the pillar - casting no shadow at all. Fibonacci numbers (0,1,1,2,3,5,8,13,21,34...) are a sequence of numbers named after Leonardo of Pisa, known as Fibonacci. The first number of the sequence is 0, the second number is 1, and each subsequent number is equal to the sum of the previous two numbers of the sequence itself.